This Thick and Creamy Seafood Chowder with is a wonderful way to enjoy seafood. Use whatever seafood you like! Great with fish, shrimp, scallops and/or lobster. Here in central Ontario, we have just emerged from one heck of a cold snap. Not just the usual Winter cold. Dangerous cold. -40 cold. I know a lot of you were caught up in this one, too. So you’ll certainly understand the need for chowder! 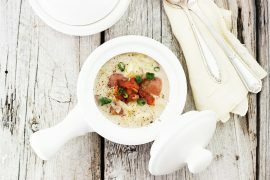 I love seafood chowder and it’s my favourite winter dinner soup. It’s so adaptable to whatever seafood you have around. Here I’ve used sole and scallops (left-over from this delicious Butternut Bisque with Pancetta and Scallops that I shared a while back. For the thickest soup, be sure to use baking potatoes, such as russet. They break down as they cook a bit and act to thicken the soup naturally, without needing to add too much cream. This soup really needs a generous seasons, especially with salt, to bring out all the flavours of the seafood. Don’t be shy. Keep adding salt until the flavours really shine! You will need 1 1/3 – 1 1/2 lbs. of seafood for this soup. Use whatever combination of seafood you like. I used 1/2 sole and 1/2 scallop for this one. 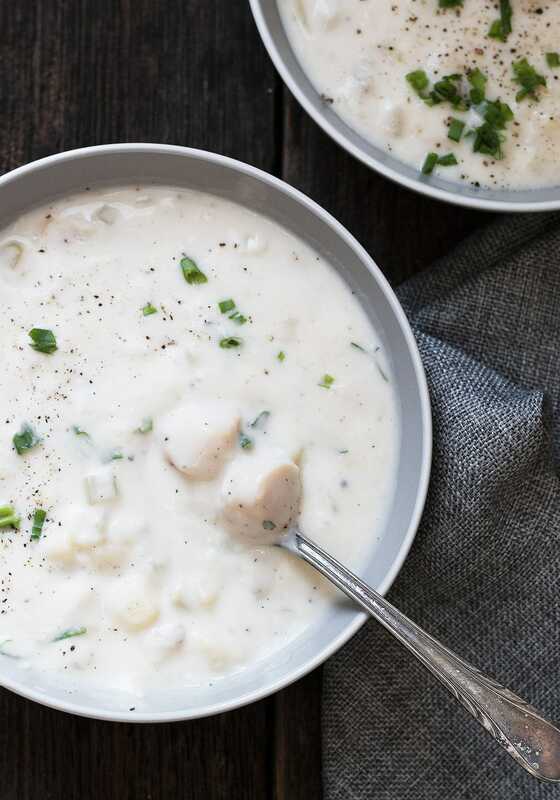 For the creamiest chowder, you’ll want to use heavy cream. If you don’t have or don’t want to use heavy cream, you could use a light cream, but you’ll want to mix in about 1 Tbsp of cornstarch with the lighter cream before adding to the soup, to help thicken the soup. No need to use fresh seafood or to thaw your seafood ahead, if you don’t want to. You can add frozen seafood directly to the poaching liquid. Just note that it will take a few extra minutes to poach from frozen. 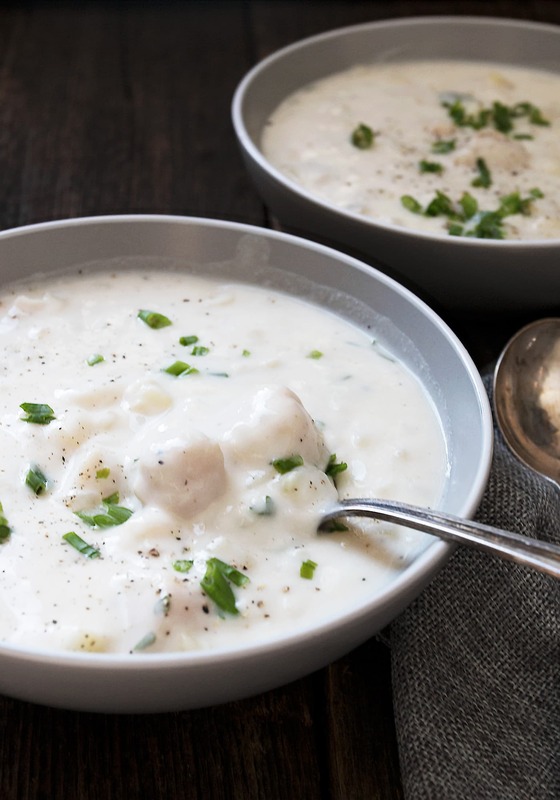 A thick and creamy seafood chowder, with potatoes and seafood of your choice. You will need a total of 1 1/3-1 1/2 lbs. of seafood. Use fish, shrimp, scallops and/or lobster, either fresh or frozen. Cook the vegetables: Melt butter in a heavy-bottomed, large pot over medium heat. Add the onions and cook until softened, about 3 minutes. Add the celery and cook, stirring for 8-10 minutes. Add the potatoes. Add enough water to the pot to just cover the vegetables with water. Bring to a boil, then reduce heat and simmer until potatoes are tender but not too soft, about 10-15 minutes (depending on the size of the dice). Remove from heat. Poaching Liquid: In a second pot, heat the 4 cups of water with a bay leaf and the 1/4 onion until just before boiling. Maintain temperature just below boiling and add the sole and scallops. Cover and cook just until seafood is opaque and tender. Remove fish and and scallops to a bowl, reserving the poaching liquid for your stock. Discard the bay leaf and quartered onion. Soup: Melt the butter in a saucepan over medium heat. Add the flour, stirring to make a smooth paste. Cook for about 1 minute. Gradually whisk in the reserved poaching liquid until your have a smooth mixture. Cook until it begins to thicken. Return the pot with the potatoes to medium heat. Slowly add the the butter/flour/poaching liquid mixture to the pot with the potatoes. Add the fish and scallops. Continue cooking and stirring until chowder thickens. Add the cream and stir until heated through, but do not boil. Season with a pinch of nutmeg and a generous amount of salt and pepper, to taste. Heavy cream is recommended for the creamiest chowder. If you don't have or don't want to use heavy cream, you can use a light cream. Simply mix it with 1 Tbsp cornstarch before adding to the soup. Can the chowder be frozen? Hi Jim and yes, it should freeze just fine. Hello Jennifer, made this the other night with scallops, large shrimp and some sole it was delicious I didn’t even add any cream….forgot it but it was so creamy. My question is for next time I strained the liquid after cooking the potatoes I did reserve it in case I needed to add some in but that was not necessary. Should the liquid have been absorbed maybe I added too much. Hi Jill, there should still be some liquid with the potatoes. You would add the butter/flour/poaching liquid mixture to the potato pot, together with any liquid in the pot. I want to make this with all shrimp. I also have seafood stock on hand. Could I use 4 cups of that instead of the poaching liquid and just add the shrimp at the end to cook through? Wait! How did I miss this? All the cozy in one bowl that one could possibly need! 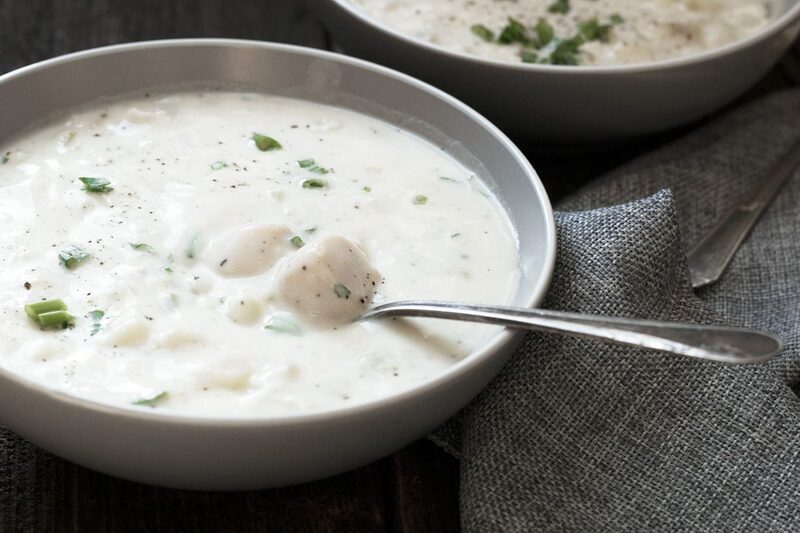 That chowder is downright DREAMY! We got hit by the storm (or bomb), but not like you!!! OMG, -40?!?!?! That’s entirely too cold. Now I feel bad for complaining about it being 9 degrees here!! I hope you managed to stay safe and warm, Jennifer!! This soup is just perfect for staying cozy and full! This looks so creamy and ultimately dreamy, girl!! Going on the menu soon!! Cheers! This is one of the prettiest chowders I’ve ever seen and I love how versatile it can be with different seafoods! Thanks Chris and yes, any seafood works. A great way to clean out bits of stuff from the freezer! 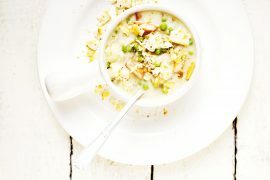 It’s a rainy January day and a cozy, comforting bowl of soup is just what I’m craving – this looks delicious! This is one of our favorite kinds of soups Jennifer. We LOVE anything with seafood, and the creamier the better! I am glad to hear the weather has improved somewhat up there. I was wondering if you ever watched the BBC series Orbit (it is on Netflix currently). 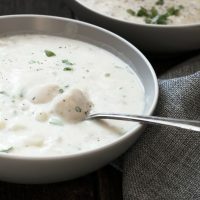 This is a chowder I would love to have in front of me as I re-watch Orbit:). Love that potato starch thickening and all the sweetness of the scallops. Stay warm! Thanks Milena and no, I haven’t watched Orbit, but love BBC stuff, so will seek it out! 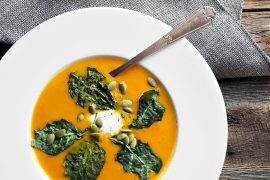 This soup looks soul-satisfyingly delicious! Love that it’s thickened mostly with potatoes, such a great way to cut down the cream without loosing creaminess. We are warming up today, thank goodness and hope you are too. Sharing and pinning!